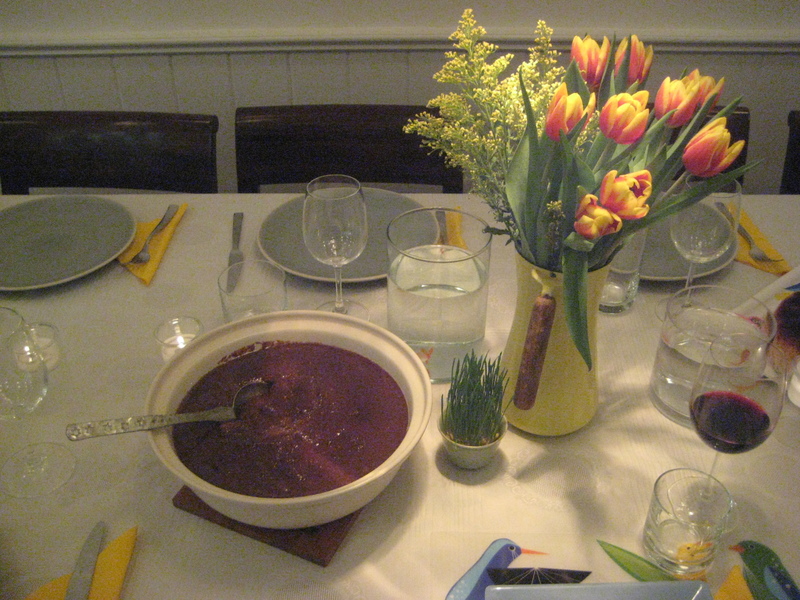 Edited on December 26, 2014 to add: This is the recipe that I used to make fesenjan for a New York Times Magazine article about Diverse Holiday Feasts From Five New York Families. I’m delighted to add that my fesenjan recipe then went on to make it on Sam Sifton’s Most Popular Recipes, 2014! Wowza! Akh joon, fesenjoon & thank you maman joon for passing on your wonderful recipe. There is a popular khoresh made with ground walnuts & pomegranate syrup, called Khoresh ‘eh fesenjan — but you can call it fesenjoon when you are on a more khodemooni (that is “intimate”) footing. Fesenjoon is just too delicious for its own good: tangy, sweet, yummy; and the texture is heaven, soft but granular and thick. Not surprisingly, it is among the top tier of special foods coveted and served for Norooz — the Persian New Year, which is just around the corner. It would be hard to find an Irooni (colloquial for Iranian in Farsi) who does not like Fesenjoon. Most likely, a typical reaction would be: “Fesenjoon? Ākh joon!” (Or: Woot! As we say in English.) And if you are a faranghi (that is, a non-Persian) odds are great that once you are properly introduced to fesenjoon, you’ll start pining for your next quality-time together. 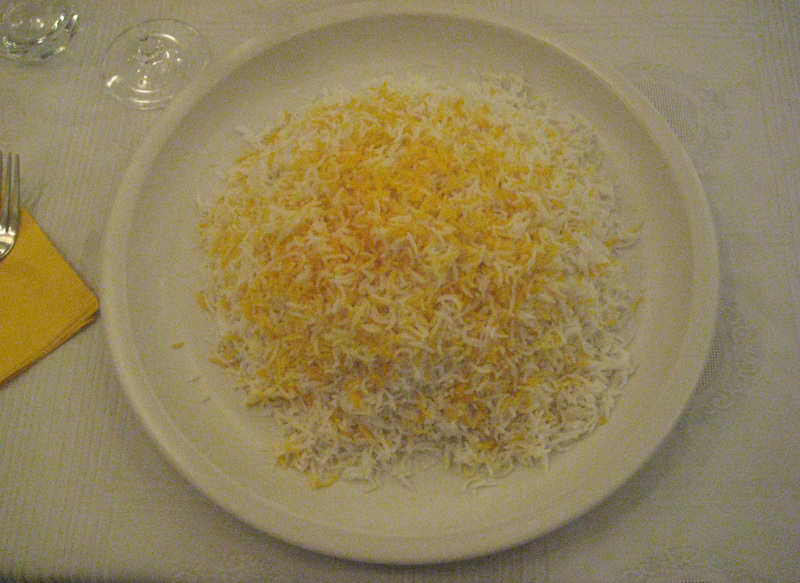 If there’s any justice in the world, your khoresh ‘eh fesenjan should be served over a perfect bed of fluffy rice imbued with the fragrance of saffron. Should you be so lucky, inhale deeply, and eat a hearty serving, and take care to form just the correct proportion of rice and khoresh in every spoonful. Since you can’t very well bring measuring devices and rulers with you to the dining table, just eyeball it to gauge the optimum proportions. Don’t worry. Practice makes perfect. Now, there are regional variations on the classic fesenjoon recipe, with some that opt to use meatballs, ducks, quince, eggplants or even fish in lieu of chicken; and some recipes that use pistachios, almond, or hazelnuts instead of walnuts. In addition to the regional variations, the classic fesenjoon khoresh itself is subject to distinct touches from one home cook to the next when it comes to the list of ingredients, method of preparation, and the favored ratio of sweet to savory to tartness. This recipe is how my esteemed mother has been making her khorosh ‘e fesenjon for almost forty years. In our family, we think it’s the bee’s knees, it moves some of us to do a happy dance, and nearly all of us request it for our birthday dinners. But anyhow. Less words. More fesenjoon. Sauté chicken pieces in olive oil until lightly golden. Make saffron water by dissolving ground saffron in 2 tablespoon of hot water. Finely grate the butternut squash. Roast walnuts in a 350 degree oven for 5 minutes. Once cool to touch, rub walnut pieces between palms to shed excess skin. (This step also removes the raw taste of walnuts, rendering them appreciably more tasty.) Then grind roasted walnuts in a food processor till you get a fine texture. Add pomegranate syrup, sautéed chicken, grated butternut squash (which according to my mom “seals the ingredients, bringing it all together and just really helps the texture”) cinnamon, pomegranate juice and the saffron dissolved in water. Also add either a cup of cold water (or chicken broth) at this point. Taste and adjust flavor to your liking with sugar, salt and pomegranate syrup. (The ideal flavor is perfectly balanced one that is tangy but also a bit sweet and definitely not too tart.) Bring mixture to a rapid bubbling boil – lid ajar – then turn down heat to low and continue to cook (mixture bubbling gently) for 45-75 minutes (or longer) till the chicken is completely cooked; the stew’s color turns a dark brown; and a layer of oil forms on the surface. Make a final taste test and adjust flavors to your liking. * For a homemade pomegranate-syrup recipe & recommendations re store-bought brands, please refer to this post. If the khoresh is too thick, add water, bring to a gentle boil, and gently boil away, uncovered, till reduced to the desirable consistency. 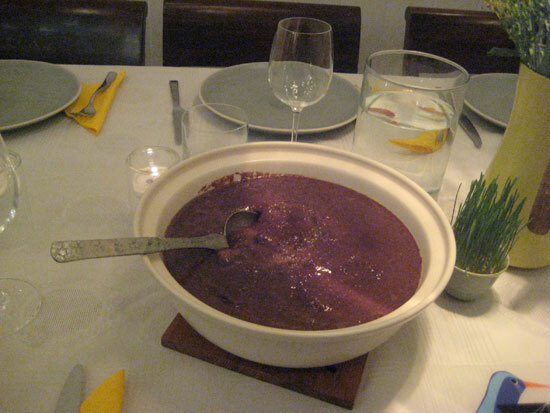 If the khoresh is too thin in texture, bring to a rapid boil without a lid, then continue to cook on very low heat (bubbling gently) till you get the layer of walnut-oil form on the surface and the color turns chocolate brown. Pour into a big serving bowl and serve hot. 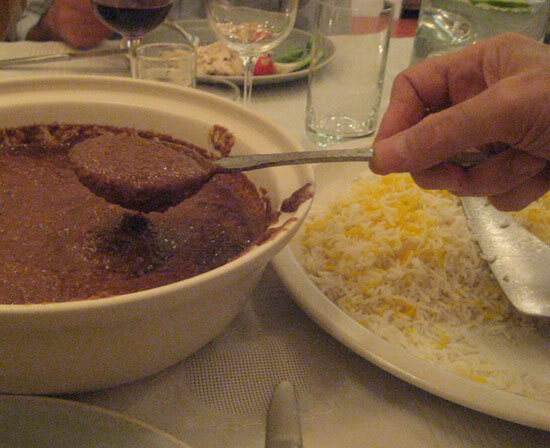 A ladle or two of khoresh served over a bed of perfect fluffy rice. Make sure you savor every single bite. For truly, blessed you are! Wow, you use butternut squash in your fesenjoon, that sounds wonderful and the pictures make me want some. It has been a very long time since I have had this delicious dish. Thank you for posting a recipe, I couldn’t remember all the ingredients and I want to make it asap! the butternut squash is theoretically optional but my mom says it somehow makes all the ingredients and flavors “settle” – if that makes sense. Do make it Suzanne! Imagining all of these ingredients mingling together is cause enough for the happy dance! Sounds absolutely amazing. Love everything about this. Especially all of that delicious walnut oil on top! Very, very delicious post, Azita. Yum and fun read! 😀 Fae. Man, this sounds delicious! Gotta try it out someday! It’s casual in Farsi as well. A little bit more formal would be “khareji” – literally “from the kharej” that is the “outside”, and in formal speech one would say “beeganeh” … language is fascinating!! Ha! Even more interesting. Begaane means ‘stranger’ in Hindi :P. Don’t think I can come up with a similar word for kharej. Agree, tracing similarity of words used in various languages is a bit of a thrill. You may enjoy this: we call tomatoes “gojeh faranghi” [gojeh being: plum] … and to delve in a bit more deeply, “faranghi” really means Western, while khareji could be anybody who’s a foreigner … I guess “khareji” is very close to “alien” in English. (less harsh than “alien” though.) … I now plan to queue up a Hindi film or two on Netflix! You are so more than welcome. I HOPE it works out for you. Do let me know! Ok? I am on vacation/spring break this week from the college and will keep checking your blog for new recipes in between stuff! Thank you! Have you ever had it? You really should if not. Truly. Ask Suzanne if you don’t believe me. I absolutely ADORE Fesenjoon. Such a delicious, sophisticated, and yet simple enough dish. I make a very simplified and unauthentic version sometimes, but I really should take it a step further and make the real thing some day, and your stew is so nice and thick, it looks delicious! I love this dish! Thanks for posting.